By placing a DVR in any remote location or overhead compartment you prevent the driver from system operational awareness, plus you defeat the mechanism of the DVR to alert the driver in case of problems or failure. The LEDs on the face of almost all mobile DVRs are there to alert of the DVR status, by moving the DVR out of sigh you make it very tough to verify DVR function. We often hear of a DVR being accessed in the case of a crime for the video evidence to find the last file on the memory was more than 2 years old. This means no one has checked or verified the system function in several years. 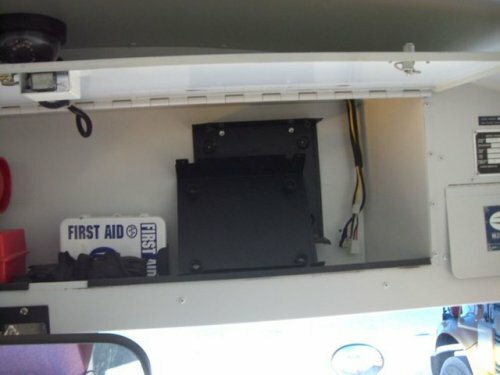 It is not enough to invest in a school bus video or vehicle camera system you must also occasionally verify they are functional. This is why a Driver Event Marker is so important it provides the driver visual awareness of DVR status when the DVR is out of sight.The best value in school bus cameras, digital bus video cameras, vehicle camera, digital in-car video cameras, mobile video surveillance systems is 100% Solid State digital like the SD4m or SD4 series.